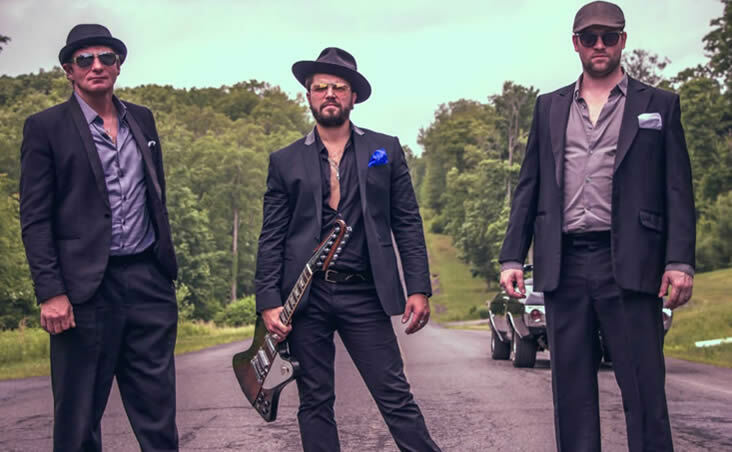 Quickly becoming known as the hardest working group in Pennsylvania, the blues/rock power trio Dustin Douglas & the Electric Gentlemen have returned with a solid sophomore LP. Released on June 1, 2018, Break It Down follows the group’s 2016 self-titled debut album and a 2017 EP called Blues 1. The group is led by guitarist and vocalist Dustin Douglas Daniel Drevitch, who has incorporated his initials into their independent label, Quad-D Records. Drevitch formerly fronted the rock group Lemongelli, was a member of The Badlees when they recorded their final, 2013 double album Epiphones & Empty Rooms, and launched his solo career with the 2014 album, Black Skies & Starlight. With the Electric Gentlemen he is joined by former MiZ bassist Matt Gabriel and former Strawberry Jam drummer Tommy Smallcomb. Unlike on their 2016 debut, the songs on Break It Down were collectively composed by all three members and most of the material was written prior to entering the studio. The album was recorded at 8 Days a Week studio and co-produced by Drevitch and studio owner Paul Smith. Another change in this album’s approach was that the group dedicated several full weekends to strictly recording and production by staying in a room above the studio, allowing them to focus all their concentration on the new material. The trio recorded the basic tracks live in the studio with vocals and minimal overdubs added later. The album was mastered by Jason Shaffer at Full Tilt Productions. Working from a large selection of 20-30 new pieces, the trio was able to be selective in finding the best songs for this album. The album commences in a surprising way with Smallcomb and Gabriel laying down a moderate funk rhythm during the long intro of “A Little Bit”. Dustin’s screeching guitar lick finally arrives about 35 seconds into the track, which was provisionally named “hip-hop song” during the demo phase. An inverse to the opener, “Destiny” arrives with full-fledged riffing and settles into a thinned out groove during the verses, while “On the Dance Floor” takes yet another approach. This third track begins with a bluesy acoustic intro and morphs into a similar electric verse and full chorus arrangement, all the while maintaining the authentic blues feel throughout the various riff-driven passages. “Turn Around” follows with a melodic chant and surprising musical arrangement featuring plenty of sonic candy over a simple dance beat and groove. This song sounds like it could easily be covered in many musical genres. One of the true highlights of Break It Down is the Southern influenced “Goodbye”, which alternates between a locked heavy rock riff and unique open chording and Gabriel’s bass licks during the verses. This song also features some rich backing vocals and a masterful slide guitar lead. “Hold of Me” returns to straight ahead rock while “My Time Is Precious” delves into pure funk in the song proper, finishing with long blues/rock lead by Drevitch. “Ain’t No Denyin'” continues the diversity as a moderate, strummed acoustic ballad topped with a potent electric lead, rich ethereal vocals and an arpeggio rhythm during the coda. A solid record throughout, the album concludes with a group of interesting songs which never double back over territory covered earlier. The bluesy “Out of My Mind” is notable for Smallcomb’s unique shuffle , while “Fat Cat” employs classic upbeat blues with double-entendre lyrics. “Your Face Is Stunning” features a hypnotic groove, first through the riff and later with some world-influenced drumming during the slightly psychedelic mid section. “Tragedy” is lyrically interesting, citing famous historical and fictional couples, with a juxtaposition of musical segments. The closer “No More Tears to Cry” was also featured on the Blues 1 EP and seems to signify the group returning to the core blues influence. 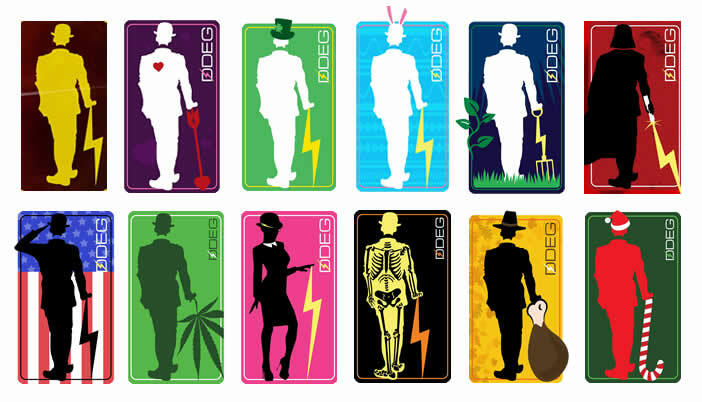 Dustin Douglas & the Electric Gentlemen have also done a masterful job in branding, from the coordinating suits to the iconic “electric gentleman” logo, which was designed by Dave Fisk and re-purposed for multiple occasions. Drevitch says the band will continue their frantic recording output, with a Blues 2 EP planned along with more LPs in future years. As for the immediate future in 2018, the group will be launching the album with a show the Kirby Center in Wilkes-Barre, PA before embarking on a summer tour which will see them expand to new markets.